These could ease symptoms of psoriasis and IBS, too. Annoyingly, adult acne seems to be on the up, with spots affecting many of us well past our temperamental teenage years. And it's not just the physical symptoms that are the problem. Acne can have a huge impact on self­-esteem, causing stress, anxiety, and depression, and can even affect personal relationships. Sufferers of acne might have spent tons of money on expensive skincare products, tried medication or expensive supplements, and paid numerous visits to dermatologists or facialists... and nothing seems to work. So how about looking at your diet? According to nutritionist Becky Graham from the Treat app, what you're putting into your body might be the cause of what's displaying on the outside. Each and every pore on your skin is actually a small opening called a follicle ­made up of a hair and a sebaceous or oil gland. The job of these glands is to keep skin protected and hydrated by providing a kind of waterproof layer. With acne, glands have a tendency to become blocked with excess oil, dead skin, or bacteria. These blockages make it difficult for the skin to shed normally, and subsequent inflammation results in painful spots. It's our number 1 source of omega 3 fats, which are­ a key anti­-inflammatory nutrient for the skin, brain, joints, and heart. 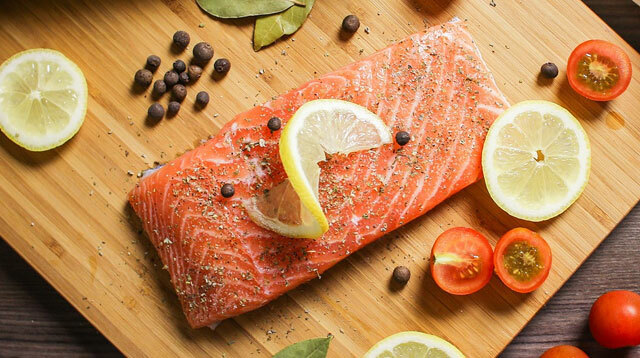 "The highest quality omega 3 are found in wild oily fish, such as wild Alaskan salmon or smaller fish like mackerel, herring, and sardines," notes Becky. We're told to cook with it all the time, but it could help your skin, too. "Coconut oil is a healthy type of saturated fat and a great stable oil to cook," the nutritionist explains, adding that "it's essential to include fats in the diet to help absorb fat­soluble vitamins A, D, E, and K." Sounds good to us! According to Becky, these seeds are full of fiber and omega 3 fats—so much so they're known as "super seeds"—and you can add them to pretty much anything. Especially walnuts—they're your "top nut" for omega 3 fats. "Brazil nuts contain selenium and zinc, two of the minerals most important for a healthy, functioning immune system," says Becky. "Prebiotic foods like artichoke, onions, garlic, and asparagus feed our beneficial bacteria, while probiotics in yogurt and kefir help to combat any unwelcome bacteria and promote a healthy immune system," our nutritionist advises. Great when paired with yogurt, as above. "Berries are packed with 'phytonutrients,' are low in sugar and high in vitamin C—an essential skin healing and immune system nutrient. Berries are also responsible for promoting collagen production, keeping skin plumped and healthy, so that's an added bonus. Not only do these look great when you Instagram your dinner, they're another great source of vitamin C and vitamin A. "The more richly pigmented better," says Becky, who advises us to eat a rainbow of red peppers, eggplant, red cabbage, carrots, sweet potatoes, and dark green leafy veg. Or the collective title of cruciferous vegetables. "They all contain a compound called indole-3­-carbinol that can help the liver to bind excess hormones and eliminate toxins," says Becky. Or just olives on their own. These are apparently key ingredients in the "Mediterranean Diet," and a fantastic source of omega 9 fats, which have been associated with protecting the skin from sun damage. So they're not just fashionable, they actually do some good, too! As well as being super tasty and incredibly versatile, avocados are also rich in omega 9 fats, vitamin C, and vitamin A. Bingo. The spice has been used for thousands of years as a natural remedy for all sorts of ailments, from pain management to nausea and digestion to immune support, plus it's a great metabolism booster. Additionally, ginger is an antioxidant with anti-­inflammatory properties that will help sort your skin right out. "These promote the release of the hormone insulin, and consistently high levels can lower an important binding protein that promotes normal skin cell turnover and prevent pores from getting blocked," explains Becky. She also adds that insulin can increase an inflammatory hormone called Insulin Like Growth Factor 1 (IGF­1), which stimulates skin cell growth and will make the problem worse. Plus, IGF­1 causes high levels of testosterone which encourages sebaceous glands to produce too much oil. Not good. But only if you have an intolerance, says Becky. "If you have an intolerance, allergy, or sensitivity to wheat or gluten, it can add to the inflammatory picture and negatively affect your skin." Farewell burgers, chips, and cookies. These tend to contain high levels of omega 6 fats, which can encourage inflammation if you eat more of these than foods with naturally anti­-inflammatory omega 3 rich fats, like oily fish. "This can increase inflammation if eaten too frequently; so stick to once or twice a week, and try to ensure the meat is organic and grass-fed to avoid hidden hormones and antibiotics," advises Becky. eczema," says the nutritionist. Explaining why, she says: "It can cause an immune reaction and also contains the growth hormone IGF­1. As long as you don't have an intolerance, live organic dairy can be great—yogurt or kefir are a good source of probiotic bacteria to help keep digestion healthy." Not technically a food, but still. "You don't want an overworked liver if you're trying to improve your skin, and alcohol puts an extra strain on this important detoxification organ. An occasional glass of red packed with antioxidants is fine... but remember the occasional part and don't go mad." Bad news if you like that smoky BBQ taste. "Chargrilling your meat and veg uses up a lot of our 'in­-house' antioxidants that neutralize 'free radicals' and prevent cellular damage and inflammation," says Becky.